Second Lieutenant Thomas William Applegarth, 11th Battalion, the Durham Light Infantry died of wounds, 8 April 1918 and is buried at Caix British Cemetery, France. He was 23 years old and is commemorated on the Evenwood War Memorial and memorials in St. Paul’s Church, Evenwood, Darlington Grammar School and Emmanuel College, Cambridge. In 1901, the family lived at Piercebridge where 38 year old Thomas was a “thrashing machine owner” and he and Hannah lived with their 2 surviving children, Thomas and Cecily and a 16 year old servant, Lizzie Walton. By 1911, Thomas and Hannah had been married 21 years and lived at West End, Staindrop. Thomas William was 17 years old and still at school, Cicely Annie was 12 and at school and brother Maurice George was 3 years old. Thomas won educated at Piercebridge Elementary School (1898-1906), Ingleton Elementary School (1906) and Staindrop Elementary School (1906-07) before winning a scholarship to Darlington Grammar School (1907-12). He was admitted to Emmanuel College, Cambridge 7 October 1912 and gained a B.A. in 1915. He was employed as a schoolmaster at Derby. The family moved to Evenwood. Thomas senior died aged 55 years being buried 8 March 1919 at Evenwood. Hannah Applegarth later lived at 2 Delaware Avenue. 11 January 1916: Thomas Applegarth enlisted at Bishop Auckland into the Army Service Corps (ASC) originally being assigned to 431 Company, ASC Horse Transport. He later served with 212 Company ASC at Clipstone Park, Nottingham and 878 Company at Woolwich Dockyard as Driver, service number T4/088917. Aged 24 years 2 months, he was 5’9½” tall and weighed 144lbs. 30 October 1917, he was commissioned to 3rd Battalion, the Durham Light Infantry. At some time between December 1917 and March 1918 he was assigned to 11/DLI and went overseas. There was a major re-organisation of the Army in February 1918 to adjust to the heavy losses of the previous year so this could be the date of his move. He entered France 14 February 1918  having been on leave at home. According to the 11/DLI War Diary Second Lieutenant T.W. Apllegarth was one of three officers captured on Good Friday 29 March 1918 during an attempt to recapture Mezieres. It was essential that final victory was gained before the American Forces arrived in Europe in huge numbers. America had entered the war 6 April 1917 and the first of her troops arrived in France 26 June 1917. In July 1917, the U.S. Commander in Chief of the American Expeditionary Force General J.J. Pershing asked for 3 million men. The build up of troops took time but eventually by June 1918, the Americans were receiving about 250,000 men a month in France. This amounted to 25 divisions in or behind the battle zone and another 55 in the United States. Added to this the poor diet of the German troops, battle fatigue, discontentment with the military leadership, social unrest at home and a general realisation that their great effort was beginning to wane, the Allies counter attack in mid July began to seize the initiative. Sweeping victories over demoralised German forces eventually led to the resignation of Ludendorff 27 October, the abdication of Kaiser Wilhelm II 9 November and the signing of the Armistice 11 November 1918. The description shows that the whole 11/DLI was involved in the attack and 3 officers including Second Lieutenant T.W. Applegarth were wounded or captured. It should be pointed out that companies and platoons were required to undertake many tasks and it is impossible to detail all action. However, it is understood that 2nd Lieut. Applegarth was a member of “A” company therefore this account refers to that company only. 21 March: The German forces attacked the whole front – no DLI Service Battalions were in the line. 11/DLI came under the orders of the 20th Division and was in reserve located at Golancourt and Voyennes. In the afternoon the battalion left for Villers St. Christophe, north of the Somme canal. 22 March: heavy firing heard to the north east in the direction of Holnon Wood and St. Quentin. 11/DLI was required to fill a gap between the 61st and 60th Brigades on the line Tugny-Lavesne. “By 8pm, when A and B companies arrived, the King’s had had to evacuate Tugny and the support line thus became the front line. A and B companies, from left to right filled the gap between D company and the Shropshires of the 60th Brigade in position further north. Before 9.00pm Capt. Endean reported that D company and the King’s had retired leaving the right flank of A company exposed. A thick fog had gathered and the enemy in Tugny could now be heard shouting in English and making a lot of noise…Soon after midnight B company were rushed from the right rear and there was confused fighting with the Durhams, Shropshires and Germans all mixed together in the fog. On the right Capt. Endean and A company fought stoutly but in withdrawing one party came under machine gun fire at close range and were all killed or wounded. About 70 men of the 11th with 30 Shropshires and some Machine Gun Corps were collected south-west of Aubigny and withdrew down the Ham road, leaving a rearguard under 2nd Lieut. English to support 2 Vickers guns which were still in action. On the way to Ham, Colonel Hayes received orders to hasten to Offay and hold the bridgehead there. At dusk German snipers were active and after dark there was German machine gun and trench mortar fire. 24 March: 4.00am, Captain Endean, 2nd Lieut. Galley and over 30 men of A company rejoined. 6.00am: German artillery and mortar attack. Despite a request, there was no reply from the British artillery. Daylight – thick fog, Germans advanced from Canizy village, were fired upon by the British then retreated. B Company regained their trench. 25 March: 5.00pm: Germans attacked again and the Durhams covered the withdrawal of the French. 26 March: 11/DLI was detailed to dig defences in the neighbourhood of le Quesnel then march off down the Amiens-Arvilles road to dig and repair trenches. 27 March: 11/DLI began to retire. 28 March: The French were to take over early 28 March and had already begun to do so when a short fierce bombardment was followed by a German advance. German infantry were seen massing in the woods. A counter attack was organised but it was obvious that the enemy was too strong but the position was maintained until orders were received to retire to Fresnoy later in the day. By the evening, 11/DLI was in reserve. 29 March: next morning the Germans attacked along the Amiens road and entered Mezieres. At 3.15pm, 11/DLI was called upon to recapture the village though they only had 130 men left. 11/DLI was now withdrawn to a position between Thennes and Hourges and passed the night in peace. 30 March: The Germans were now in Moreuil Wood and the battalion formed a defensive flank in this direction. 31 March next morning: The enemy attacked again. At 4pm came a determined advance but rifle and Lewis gun fire stopped the enemy who retreated leaving many dead and wounded behind. Capt. Endean was wounded during this action. There was some shelling after this but the evening and night passed without further incident. 1 April: no attack. In the evening came relief. Marching to the Amiens road, the battalion now the strength of a strong platoon journeyed by bus to Quevavillers some 12 miles south-west of the city. 10 April 1918: A telegram was sent to the family of Second Lieutenant T.W. Applegarth stating that he was missing believed wounded. At that time, the authorities had a note dated 6 April that he was wounded and suffering from “traumatic tetanus shot wound chest” at Wundstarr, Krampf, Bruslschuss. A further note to T. Applegarth [his father] reported that he had died 8 April 1918 as a prisoner of war at Feldlagartl, Beaufort and he had been buried at the Military Cemetery, Beaufort at grave 74. Later research records that between 21 March and 9 April 1918, 11/DLI lost 2 Officers and 78 Other Ranks killed in action or died of wounds. Second Lieutenant T.W. Applegarth was awarded the British War and Victory medals. 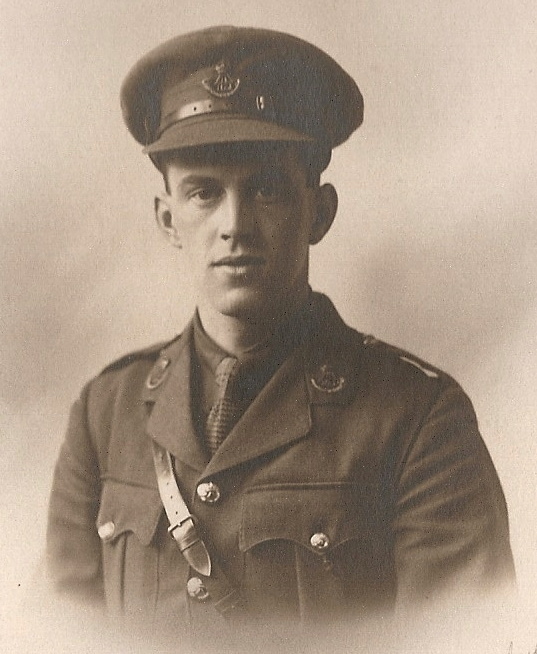 Second Lieutenant T. W Applegarth is commemorated on the Evenwood War Memorial, the Roll of Honour in St. Paul’s Church, Evenwood, and memorial plaques at Emmanuel College, Cambridge and Darlington Grammar School. Emmanuel College details state 18 September 1893 where as a family tree states 15 October 1894. “The Durham Forces in the Field 1914-18: The Service Battalions of the Durham Light Infantry” 1920 Capt. W. Miles Note: It is understood that 2nd Lieut. Applegarth was a member of “A” company therefore this account refers to that company only.